Sarah Swaringen was not as active a participant in her journey to the Stanly County jail as the subjects in my first two "Bad Girls" series. She didn't run a brothel and party house, and she didn't make the papers. But what she had in common with Julia Ann Ross landed her in the hot seat. 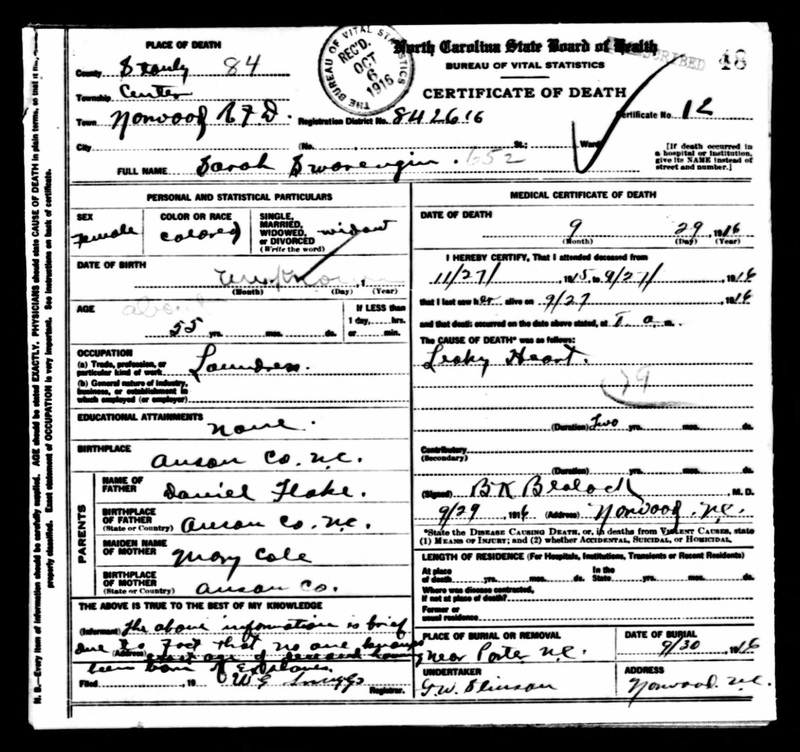 Sarah was born in Anson County, probably near the banks of the Rocky River, not far from the forks of the Rocky and Pee Dee rivers, near Norwood, NC. She was born Sarah Flake, daughter of Daniel Flake and his wife, Mary Cole Flake, aobut the year 1856. She first shows up in the 1870 census, with an older brother, Ephraim and 3 younger siblings. Her father David was listed as a farmer, but had no property value, which probably meant he was working for another farmer, or perhaps share-cropping, as was common at the time. Perhaps he was working in conjunction with his neighbor John Hudson, who did have property, which puts him in the area of East Macedonia Church. The 1880 census still shows Sarah as being born about 1856 and still living with her parents in Center Township, now a young adult. She, and her younger brother, Willie, were helping their father work the farm. None of them could read or write. But Sarah's simple life as a farm girl was about to take a big change, when on February 6, 1882, 23 year old Sarah Flake, daughter of Daniel and Mary Flake, married 30 year old Charlie Tillman (Jr), son of Charlie and Jane Tillman. 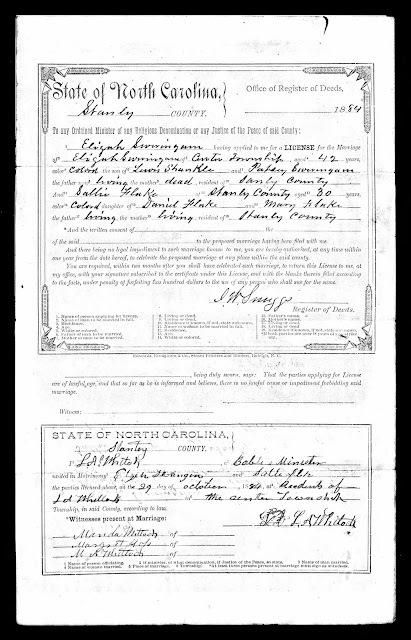 The problem with that, was well, this is where Sarah Flake fell into the same category, was that Charlie Tillman had married Laura Ledbetter in Anson County, where he was originally from, on November 29, 1873, nearly ten years prior. The 1880 census showed Charlie and Laura as the parents of two children, already. And Laura was not dead when Charlie and Sarah married in 1882. In fact, the 1900 census shows the couple still living together, and having had more children together as well. It's not clear if Charles and Sarah actually lived together, or if they did, how long. What is clear is that on October 29, 1884, just two years later, Sarah married Elizah or Elijah Swaringen, of Norwood. She forgot about one little thing, though, she forgot to obtain that complicated piece of paper better known as a "Divorce". For her benefit, Sarah was probably just a simple country girl. The census records detail that she was uneducated. Her family was also not that far removed from a subculture, where, well, rules did not apply, as her death certificate would detail. Her parents, and Sarah herself, were born into slavery. Slaves were not held to the same social constrictions of marriages, divorces, and legal proceedings as freeborn persons. Then suddenly, they were freed, when Sarah was but an 8 year old girl. And just as suddenly, they were expected to "know all this stuff", to conform to the legal jigamorro that freeborn and better educated persons were expected to uphold. To go from "jumping the broom" to filing for divorce in a court of law. When you could not even read, how could you be expected to know the law? To his credit, Elijah Swaringen had been married to his first wife, Angelina Huckabee, and had a few children already, but was a widower when he married Sarah Flake. Angelina seems to have died immediatly after the birth of her last child, Clarence. It took a couple of years for someone to figure out that Sarah Flake/Tillman/Swearingen had more than one husband at a time. She was first brought to Superior Court at the Spring Term of 1886. She may have been to a lesser court before that, but I disc I am currently involved with was for Superior. She was charged with bigamy. The case would drag on for a few years. Continued for defendant for want of witness, Martha Bennett, ipus subpoena to Anson for witness Deft. recognized with David Flake as surety in the sum of $200 for her personal appearance at the next term of court and not depart the same without leave. Martha Bennett, Sarah's witness, lived in Ansonville. 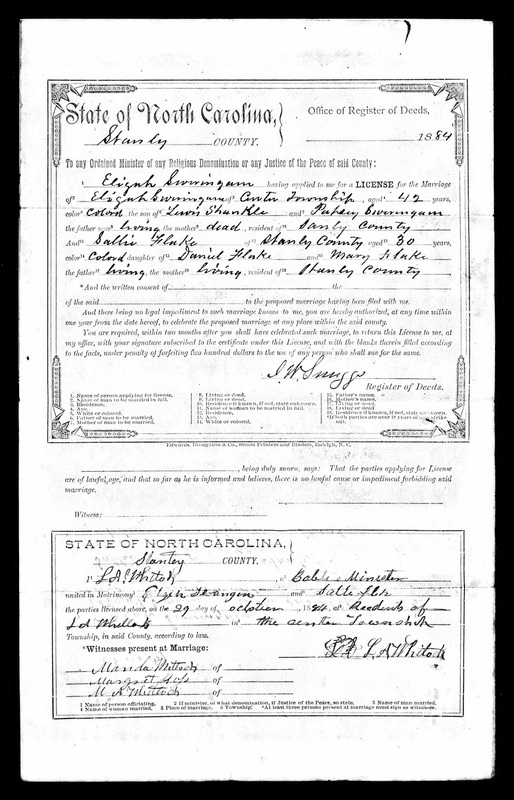 David Flake, her bondsman, also lived in Wadesboro, and was close in age to Sarah. He may have been her brother. The next time her case came up, Sarah was found guilty of Bigamy and given to the custody of the sheriff until the costs of court were paid. Judgement suspended upon payment of costs. I was pretty certain, but I did a little background searching to be sure, but Sarah was judged by an all male, all white jury. Sarah was by far not the only female sent to jail that day. Judge John A. Gilmer had sent quite a few ladies into the custody of the sheriff that session. Sarah Swarengen joined Catherine Bowers and Catherine Hinson, Mary Reap, Ella Yow, Ann Carpenter, Martha Almond and Phoebe, alias Neely, Huneycutt. Sarah's marriage to Charles Tillman was anulled, he having had a living wife when he married her. His case was remitted to Anson. It appears that Sarah, after her experience on the wrong side of the law, returned to a life of married bliss with Elijah Swaringen, and became a mother. The 1900 census has the family living in Center, Elijah was a farmer and owned his own farm. What was even more encouraging was that all of the children could read and write. Sarah was noted as being the mother of 5 children, with 3 living. Those three would have been Ella, Jackson and Addie. Isabella and Clarence were the children of Elijah and first wife Angelina. Froney Smith was noted as being a daughter, but with a different last name, she was possibly an adopted daughter. The two that passed away may have been the two little girls in the 1880 census who were named as granddaughters of Daniel and Mary Flake. The couple was noted as having been married for 14 years, but it was actually more like 16. By 1910, Sarah was said to have been the mother of 6 children, with only two living, Jack (Jackson) and Ada (Addie). This would have meant that Ella had died. But this was incorrect, as just the year before, Ella Swaringen, daughter of "Lige" and Sarah Swaringen married John Deberry, son of Jerry and Violet Deberry, on October 17, 1909. She was very much alive and well in 1910 all the way through 1940 and raised a daughter, Annie Mae and a stepson, Clyde. Perhaps Sarah misunderstood and took it as how many children were living with her. 1910 would be Sarah Flake Swaringen's last census. She passed away on September 29, 1916. Based on the two census records when she was young, giving her year of birth as 1856, which I believe is the most accurate, this would put her at about 60 years old. Her death certificate is rather sad. She is described as a Laundress and the reason for her death was a "Leaky Heart", which is also called Valve Regurgitation. Her birthdate was unknown, but her age estimated at 55 "about". Her birthplace was given as Anson, and her parents correctly listed as Daniel Flake and Mary Cole. Elijah had preceded her in death, as she was a widow. There was no informant listed, but the Registrar, W. E. Snuggs left a note. The undertake was G. W. Springer of Norwood, although the handwriting is particularly rough. 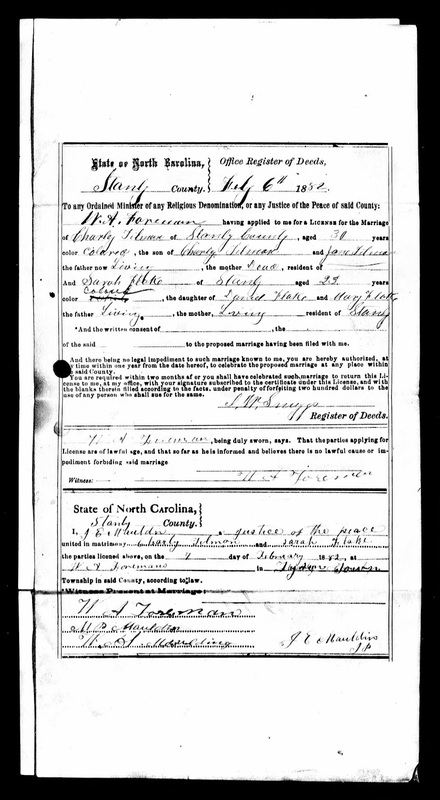 I believe the place of burial says, "near Porter, NC" because that is the area where she grew up. The note left by the registrar in place of an informant states " The above information is brief due to the fact that no one knows.exact age of deceased having been born of Exslaves". Sarah Swaringen shared the fact that she became involved with a married man with Julia Ann Ross, however she did not make the papers as all parties involved were of African ancestry. She and Elijah and Charlie and Laura Tillman left descendants to carry on, many of them migrating to larger cities, such as Charlotte and Winston-Salem, and other states, like South Carolina and New York.